Draft: 2005, Oakland Athletics, 1st rd. Clifton Randolph Pennington was originally signed by A's scout Blake Davis…he and his wife Missy have three children: Brady, Hudson and Kingsley…prepped at Mary Carroll High School in Corpus Christi , TX…earned third-team All-American honors, first-team All-State and All-District honors during his senior year…played collegiate baseball at Texas A&M University…hit .339 with five home runs, 35 RBI and 21 stolen bases during his sophomore campaign…across three seasons with the Aggies, hit .345 with 115 RBI and 53 stolen bases. Signed a minor league deal with Cincinnati Feb. 17 and made the Reds Opening Day roster…was selected from Triple-A Louisville March 29 and went 4-for-29 (.138) in 16 games…drew five walks for a .265 on-base percentage…did not have an extra base hit or RBI…the switch-hitter went 3-for-26 (.115) against right-handed pitchers, 1-for-3 (.333) against left-handers…was 0-for-8 with runners in scoring position…started five games at third base and one at shortstop…was 2-for-5 (.400) as a pinch hitter…had a pinch hit single in his first at bat as a Red on March 31 against Washington…went 3-for-9 (.333) over his first six games through April 9 but then went 0-for-18 over his next nine contests…pitched for the first time in a regular season game April 12 against St. Louis (1.0 ip, 1 h, 1 r, 1 er, 2 bb, 1 so)…was a defensive replacement at third base in the seventh inning and then took the mound to start the ninth inning with the Reds trailing 12-4… allowed a RBI double to Jose Martinez…his first pitching appearance came in Game 4 of the 2015 ALCS…went 1-for-2 on April 25 against Atlanta but that would be his final game in the majors as he was optioned to Louisville the next day. MINORS: Was outrighted to Louisville April 28 and went 8-for-30 (.267) with a RBI in 11 games before he elected free agency May 17…was signed by the Texas organization to a minor league contract the next day and was assigned to Triple-A Round Rock…it .204 with a home run and 13 RBI in 61 games with the Express…combined with both clubs to hit .211 with a home run and 14 RBI in 72 games…added 36 walks for a .311 on-base percentage…batted .328 (21-for-64) against left-handed pitchers compared to .170 (31-for-182) against right-handers…hit .159 with runners in scoring position, including .133 with RISP and two outs…started 52 games at shortstop, five at second base and five at third base…committed five errors, all as a shortstop (.978 fielding percentage)…hit in every spot in the batting order and saw his most action with 26 games batting seventh…went 4-for-22 (.182) over his first nine games with Louisville…then had back-to-back multiple hit games on May 10 and 13 (4-for-8, .500) before becoming a free agent…went 2-for10 (.200) in four games with Round Rock before he was placed on the disabled list May 22 with a strained left oblique…was reinstated June 24 and had multiple hit games in each of his first two contests following his return (4-for-8, .500)…then went 2-for-27 (.074) over his next seven games…went 12-for-40 (.300) with five doubles over a 10-game stretch from July 7 to 20…walked a season-high four times July 30 against Reno…finished July with a .253 batting average in 24 games and then went 3-for-6 with his lone home run of the year and a season-high four RBI Aug. 1 at Albuquerque…went 0-for-27 over a nine-game stretch from Aug. 5 to 15 and hit .163 in 26 games in August. Spent the season with the Angels and made 87 apps...for the Angels played 2B (47g, 35gs), 3B (18g, 11gs) and SS (18g, 18g, 4gs)...following the season became a free agent and on 2/15/18 was signed by the Reds to a minor league contract with an invitation to Major League spring training camp. In ninth big league season and fi rst with the Angels, made just two errors in 438.1 innings...Appeared at second base (58 G), shortstop (17 G), fi rst base (3 G) and third base (1 G), posti ng a .991 fi elding percentage...Matched 2015 home run total in just 35 games...Limited to 74 games aft er two diff erent D.L. sti nts with a left hamstring strain. In eighth big league season, combined to hit .210 (44-for-210) with six doubles, three home runs and 21 RBIs for Arizona and Toronto. Began the season with the Diamondbacks, appearing in 72 games and batting .237 (32-for-135) with a home run and 10 RBIs before being traded to the Blue Jays, Aug. 8... Finished the season going 12-for-75 (.160) in 33 games for the Jays. Appeared at four different positions (2B, SS, 3B, LF), posting a collective .964 fielding percentage in 244 chances. Batted .254 (45-for-177) with five doubles, three triples, two home runs and 10 RBI in 68 games for Arizona... Missed over two months due to a left thumb injury... Appeared in 23 games at shortstop, 18 at second base and 8 at third, posting a combined .989 fielding pct. (2 E in 186 TC)... Hit .265 (13-for-49) as a right-handed hitter, the best mark of his career (.247 in 2013)... Set a career high with four runs scored on Aug. 9 vs. Rockies...Hit his first career pinch-hit homer on Aug. 24 vs. Padres... On 15-day disabled list from June 3-Aug. 6 with a sprained left thumb... Visited the Walter Reed National Military Medical Center in Bethesda, Md., on Aug. 20. Appeared in 96 games in his fi rst season with the D-backs and hit .242 (65-for-269) with 13 doubles, 1 triple, 1 home run and 18 RBI... Played 51 games at shortstop, 29 at second base and 2 at third…combined for a .975 (8 E) fi elding percentage... Hit .529 (9-for-17) with 3 RBI in extra innings... Recorded a walk-off single in the 16th inning on April 3 vs. Cardinals and ninth on May 27 vs. Rangers (Game 2)... Received his fi rst career ejection on April 13 vs. Dodgers... Tied a club record with 5 walks on Aug. 24 @ Phillies. Appeared in 125 games with Oakland, hitting .215 (90-for-418) with 18 doubles, 6 home runs and 28 RBI...Combined to post a .981 fielding percentage (11 E in 585TC) in 93 games at shortstop and 32 at second base...hiscareer-best .979 mark at shortstop (9 E in 431 TC) wasthe highest by an A's player (min. 90 games) since MikeBordick in 1995 (.983)...Grounded into just 1 double play in 63 situations, thesecond-lowest percentage (1.6) in the American Leaguebehind the White Sox' Alejandro De Aza (1.5)...since1940 when GIDP became an official stat, the 1 GIDPwas the fewest in Athletics history (min. 400 at-bats)...On disabled list from July 20-Aug. 7 with left elbow tendinitis, including 3 rehab games with Triple-A Sacramento...Batted .295 (26-for-88) over his final 28 games and .267since moving to second base following the Stephen Drewtrade on Aug. 20...POSTSEASON: Hit .286 (4-for-14) with 1 RBI in 5 ALDSgames vs. Detroit. Improved on his numbers from a year ago, as he hit .264 with eight home runs and 58 RBI in 148 gamesafter batting .250 with six home runs and 46 RBI in 156 games in 2010...had career highs in hits (136),home runs, RBI, at-bats (515), strikeouts (104) and caught stealing (9)...matched his high in doubles(26)...led the A's in games played and sacrifice hits (8)...his .264 batting average was the highest amongOakland qualifiers, but it was the lowest mark by a team-leader in Oakland history...the previous low was.267 by Rickey Henderson in 1982...it was the lowest mark by an A's team leader since Bobby Estalella hit.259 for the 1943 Philadelphia A's...ranked fifth in the American League with a .348 batting average withrunners in scoring position...that included a .286 mark before the All-Star Break and .423 after the break...grounded into just five double plays and his average of 103.0 at-bats per GIDP was second best in the AL...was successful in just 14-of-23 (60.9%) stolen base attempts, which was the lowest percentage in the ALand tied for third lowest in the majors...it was the lowest mark by an Athletic since Mike Bordick went10-for-20 (50.0%) in 1993...was batting .235 with three home runs and 23 RBI in 88 games at the All-StarBreak...then hit .303 with five home runs and 35 RBI in 60 games after the break...slugged .306 beforethe break, .452 after the break...has hit 12 of his 18 career home runs after the break...the switch-hitterbatted .270 against left-handed pitching compared to .262 against right-handers...his career numbers are.258 (94-for-365) against lefties, .260 (251-for-965) against righties...hit seven of his eight home runs offright-handed pitching...batted .237 in Oakland, .293 on the road...stole 11 of his 14 bases on the road...batted .228 with the bases empty, compared to .320 with runners on base...six of his eight home runscame with runners on (three two-run, three three-run), as have 11 of his 18 career home runs (six two-run,five three-run)...was 4-for-8 (.500) with nine RBI with the bases loaded...started games in every spot inthe order except fourth and fifth...hit .285 with five home runs and 25 RBI in 77 games batting ninth...ranked second among AL number nine hitters in RBI and fourth in batting...hit .216 when leading off aninning...with 104 strikeouts and eight home runs, he is just the fifth player in Athletics history with 100or more strikeouts and fewer than 10 home runs in a season (Green, 1966; Monday, 1968; Christenson,1998; Hannahan, 2008)...batted .172 in interleague play after hitting .396 against the National League in2010...committed 22 errors, which was second most among AL shortstops...his .964 fielding percentagewas second lowest in the AL and the lowest by an A's shortstop since Alfredo Griffin had a .963 fieldingpercentage in 1987. OAKLAND: Got off to a slow start, hitting .195 over his first 15 games through April 17...then hit .289over a 49-game stretch from April 19 to June 11, including a nine-game hitting streak from May 22-30 (14-for-34, .412), which was the longest of his career at the time...batted .149 over his final 24 games beforethe All-Star Break beginning June 12...snapped a season-long 0-for-23 streak with a first-inning single June 29 against Florida...finished June with a .202 batting average, but then hit .341 in July...his Julyaverage was the highest single-month mark of his career (previous: .338 in June, 2010)...had a career-high15-game hitting streak from July 15-31...batted .418 (23-for-55) with 11 runs scored during the streak,which was the longest by an A's switch-hitter since Scott Spiezio set the record with an 18-game streakfrom May 21-June 9, 1998...walked in the third inning July 20 at Detroit to snap a career-long streak of 16consecutive games without a walk...struck out in the fourth inning July 27 against Tampa Bay to snap acareer-long streak of 11 games and 47 plate appearances without a strikeout...missed two games in SeattleAug. 2-3 due to Bells palsy...left the Aug. 1 game against the Mariners in the bottom of the sixth inningdue to effects of the temporary malady which causes partial facial paralysis...was diagnosed with thecondition earlier that day...was successful in just 6 of his 15 (40.0%) stolen base attempts entering playAug. 6...had the fourth two-steal game of his career that day at Tampa Bay and was successful in each ofhis eight stolen base attempts over his final 42 games...had a career-high-tying four RBI Aug. 25 at NewYork (also April 27, 2010 at Tampa Bay)...drove in 17 runs over a 13-game stretch from Aug. 25 to Sept.6...matched his career high with four hits Sept. 1 at Cleveland (also April 27, 2010 at Tampa Bay and July1, 2010 at Baltimore)...that lifted his batting average to a season-high .272...went 16-for-74 (.216) overhis final 19 games to finish the year at .264...made his first career start batting third at Texas Sept. 11 andwent 2-for-3. Hit .250 with six home runs and 46 RBI in 156 games in his first full season at the Major League level...ranked fourth in the American League with eight triples and tied for fourth with 12 sacrifice hits...led theA's in triples and tied for the team lead in sacrifice hits...the triples tied for the sixth-best single season totalin Oakland history and were second-best over the last 23 years (Eric Byrnes, 9 in 2003)...five of the triplescame at home, which tied the Coliseum record set by Bill North in 1976 and matched by Tony Armas in1980...the sacrifice hits were the most by an Athletic since A.J. Hinch had 13 in 1998...was successful in29-of-34 (85.3%) stolen base attempts, which was the fifth-best percentage in the AL and ninth best in Oaklandhistory (min. 20 attempts)...the 29 steals were the most by an A's infielder since 1989 when CarneyLansford had 35 of his 37 steals while playing the infield...since 1977, the only A's shortstop with moresteals is Alfredo Griffin, who had 33 in 1986...tied for sixth in the AL in bunt hits (7)...led all AL fieldersand ranked third in the majors with 25 errors...those were the most errors by an Oakland shortstop sinceMiguel Tejada had 26 in 1998...committed just five errors over his first 56 games (.981 fielding percentage)but had 20 over his final 100 contests (.958)...tied for the lead among AL shortstops in games played(156) and ranked second in total chances (739), assists (496) and double plays (100)...had the third lowestfielding percentage (.966) among AL qualifiers at shortstop, the lowest mark by an Athletic since AlfredoGriffin fielded .963 in 1987...the switch-hitter batted .258 against left-handed pitching and .247 againstright-handers...his career splits are .249 against lefties and .259 against righties...hit .197 with runners inscoring position and two outs and was 3-for-17 (.176) with the bases loaded...is now 4-for-28 (.143) inhis career with the bases full...four of his six home runs came with runners on base (two three-run, twotwo-run)...hit three home runs over his first 21 games and three over his final 29 contests...had a careerlong 105-game, 353-at bat homerless streak in between (April 27-Sept. 2)...batted .229 over the first fiveinnings, .275 with five of his six home runs in the sixth inning or later...had a .206 batting average and .253on-base percentage when leading off an inning...batted .396 in interleague play...tied for the interleaguelead with two triples and ranked sixth in batting...had the third best interleague average in Oakland history...hit just .233 against the AL...made a team-leading 107 starts batting ninth but also hit .210 with a.291 on-base percentage in 26 starts in the leadoff spot...ranked third in the AL in RBI (36) from the ninthspot in the batting order and tied for fourth in home runs (5). OAKLAND: Walked a career-high three times in the second game of the season, April 6 against Seattle...hit .214 over his first 18 games through April 23...then went 16-for-47 (.340) over his next 13games from April 24 to May 8...established career-highs with four hits and four RBI April 27 at TampaBay and matched his best with two doubles...had another four-hit game July 1 at Baltimore...had a streak of 13 consecutive stolen bases without a caught stealing from May 17 to Aug. 4...at the time, itwas the longest streak by an Athletic since Rickey Henderson had 15 consecutive steals from July 22to Aug. 19, 1998...went 11-for-92 (.120) over a 25-game stretch from May 11 to June 9...that includeda career long 0-for-27 streak from May 22 to June 1...snapped the hitless streak with a second-inningbunt single June 2 at Boston...then hit .414 (41-for-99) over a 31-game stretch from June 10 to July 19,which was the second best mark in the majors over that span (Hamilton, TEX .434)...scored a careerhighthree runs June 15 at Chicago (NL)...batted .338 in June, which was the best month of his career...his previous best was a .313 mark in Sept., 2009...was batting .271 in 88 games through July 19 andthen hit .220 over his final 68 contests, somewhat hampered by an injured left shoulder that requiredsurgery following the season...had his second career two-steal game, Aug. 4 against Kansas City...alsostole two bases Sept. 27 at Los Angeles...his home run Sept. 3 against Los Angeles was his first sinceApril 27 at Tampa Bay, a 105-game homerless streak...it was the third longest homerless streak by anAthletic over the last 14 years...committed an error in back-to-back games Sept. 20 and 21, the fifth timehe made an error in consecutive games. Began the season at Triple-A Sacramento but was promoted to Oakland July 31 following the OrlandoCabrera trade...started 60 of the A's final 61 games at shortstop...was hitting .264 with three homeruns, 40 RBI and 27 stolen bases in 99 games with Sacramento when the A's called and went on to bat.279 with four home runs, 21 RBI and seven stolen bases in 60 games with Oakland...the switch hitterbatted .307 (47 for 153) against right-handed pitching and .200 (11 for 55) against left-handers...nowhas a .280 (60 for 214) career average against righties and .237 (22 for 93) against lefties...also had a.340 batting average when leading off an inning, .333 during day games and .317 on the road...nowhas a .295 (46 for 156) career average on the road compared to .238 (36 for 151) in the Coliseum...did not commit an error in his first 32 games at shortstop, giving him a 35-game errorless streak datingback to 2008...that equaled the fifth longest errorless streak by a shortstop in Oakland history and wasthe longest since Rafael Bournigal had a 41-game streak from Sept. 21, 1997 to Sept. 18, 1998...thenmade eight errors over his final 28 games and finished with a .971 fielding percentage...the A's won allfour games in which he homered...made a team-leading 55 starts hitting ninth with his other five startsbatting eighth...his .295 batting average in the nine spot was second best in the American League (min.150 PA)...hit .309 with three of his four home runs against a pitcher the first time he saw him in a gameand .217 after that. Began the season at Double-A Midland but finished it in Oakland where he started each of the A'sfinal 19 games...was selected by the A's Aug. 12 and went 6 for 35 (.171) with two walks and two RBIover his first 17 games...then started at shortstop Sept. 8 at Detroit and hit .281 with seven RBI and 11walks (.397 on-base percentage) over his final 19 games, all starts...four of those starts came at shortstopand 15 came at second base, including each of the last 10...batted .242 with no home runs and nine RBIin 36 games overall in his Major League debut...the switch-hitter batted .289 against left-handed pitchersand .213 against right-handers...12 of his 13 walks came against right-handers...hit .293 during theday and .207 at night...made a total of 29 starts with the A's, including 15 at second base, eight at thirdbase and six at shortstop...did not commit an error in 16 games total at second base (77 chances), buthad one error as a third baseman for a .950 fielding percentage and four errors at shortstop for a .867percentage...made his debut Aug. 12 against Tampa Bay with a start at third base...went 0 for 7 overhis first five games before doubling in the eighth inning off Javier Vazquez Aug. 17 against Chicago forhis first Major League hit...had a two-run single Aug. 22 at Seattle for his first RBI...compiled a careerbest seven-game hitting streak from Aug. 31 to Sept. 12 (9 for 22, .409)...had the first two steal game ofhis career Sept. 22 at Texas and stole four bases in 36 games with the A's...batted a combined .280 withtwo home runs, 34 RBI and 31 stolen bases in 115 games with Midland and Triple-A Sacramento...his93 walks fueled a .404 on-base percentage...tied for fourth in all of minor league baseball in walks...ledthe A's farm system in walks and on-base percentage, tied for second in runs (89) and was fourth in stolenbases...had minor league bests in batting, on-base percentage, walks and stolen bases and matchedhis career best with five triples...was rated as having the Best Strike-Zone Discipline, Best DefensiveInfielder and Best Infield Arm among A's prospects in Baseball America's Best Tools survey...hit .302against left-handed pitching and .270 against right-handers...his averaged improved to .310 with runnersin scoring position...saw most of his action batting leadoff, where he hit .232 in 49 games...hit.317 in all other spots in the order...appeared in 80 games at shortstop, 32 games at second base andthree at third base...committed 14 errors as a shortstop for a .966 fielding percentage, eight errors atsecond base for a .952 percentage and two errors at third base for a .818 percentage...began the seasonat Midland where he batted .260 with a .379 on-base percentage in 50 games...was successful in 20 of21 (.952) stolen base attempts and finished second on the RockHounds in stolen bases...scored fourruns in a game twice over a three-game span April 28 against San Antonio and April 30 against CorpusChristi...stole 10 bases over a nine-game span from April 30 to May 8, including a season high threesteals May 8 at San Antonio...was promoted to Sacramento May 30 and went on to hit .297 with a .426on-base percentage in 65 games...finished second on the River Cats with 54 walks and 11 stolen bases...had a season best 14-game hitting streak from June 11 to 24 (19 for 53, .358)...played for Team USA inthe Futures game at Yankee Stadium and was 0 for 2...was a perfect 4 for 4 with a walk Aug. 9 at LasVegas...was leading all of minor league baseball in walks (93) and was tied for sixth in runs scored (89)when he was promoted to Oakland Aug. 12. Split his season between Single-A Stockton and Double-A Midland and combined for a .253batting average, 30 doubles, five triples, eight home runs and 57 RBI in 138 games...added 81 walksfor a .346 on-base percentage...had minor league bests in games, at bats (557), runs (91), hits (141),doubles, triples, home runs, RBI, strikeouts (89) and slugging (.368)...led the A's farm system in runs,ranked second in walks, third in hits, fourth in doubles and fifth in stolen bases (17)...batted .272 againstright-handed pitching and .187 against left-handers.....committed 27 errors in 130 games at shortstopfor a .957 fielding percentage...also appeared in eight games as a second baseman...batted leadoff 125times and also hit second eight times and third four times...began the year at Stockton and hit .255 withsix home runs and 36 RBI in 68 games with the Ports...was transferred to Midland June 19 and batted.251 with two home runs and 21 RBI in 70 games with the RockHounds...played for the Arizona FallLeague Champion Phoenix Desert Dogs following the season and batted .241 with one home run and 10RBI in 23 games...ranked second in the AFL with 18 walks and had a .410 on-base percentage...was aperfect 9 for 9 in stolen base attempts. Began his first full season as a professional at Single-A Stockton and hit .203 with two homeruns and 21 RBI in 46 games before going on the disabled list June 25 with a strained right hamstringthat effectively ended his season...was sent to the A's affiliate in the Arizona Rookie League for a rehabassignment from Aug. 10 to 27 and hit .464 with six RBI in nine games before being shut down forthe remainder of the season...committed 10 errors in 46 games at shortstop for a .947 fielding percentage...at Stockton, he batted .222 with both of his home runs and 18 of his 21 RBI against right-handedpitching compared to .157 against left-handers...his average improved to .286 with runners in scoringposition, including .357 with RISP and two outs...got off to a slow start as he hit just .103 in April...improved to .231 in May and then batted .340 in 12 games in June. Batted .276 with three home runs, 29 RBI and 25 stolen bases in 69 games in his professionaldebut with Single-A Kane County...added 39 walks for a .364 on-base percentage...finished secondin the A's farm system in stolen bases despite missing nearly three months of the season...was rated asthe number five prospect in the Midwest League and the third best prospect in the A's farm system byBaseball America...batted .284 against right-handed pitchers and .253 against left-handers...made allof his defensive appearances at shortstop where he committed 13 errors in 65 games for a .958 fieldingpercentage...collected his first professional hit June 25 at Clinton when he went 2 for 5...hit his firsthome run July 10 at Lansing...had back-to-back three steal games Aug. 1 against Quad Cities and Aug.2 at Peoria...was transferred to Single-A Stockton Sept. 6 and went 1 for 7 (.143) in two postseasongames with the Ports. April 5, 2019 SS Cliff Pennington assigned to Scranton/Wilkes-Barre RailRiders. 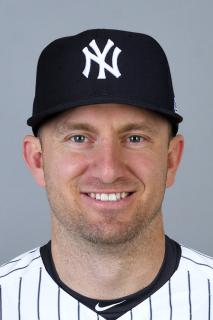 April 4, 2019 New York Yankees signed free agent SS Cliff Pennington to a minor league contract. March 31, 2019 Las Vegas Aviators released SS Cliff Pennington. February 19, 2019 SS Cliff Pennington assigned to Las Vegas Aviators. February 15, 2019 Oakland Athletics signed free agent SS Cliff Pennington to a minor league contract and invited him to spring training. November 2, 2018 SS Cliff Pennington elected free agency. June 24, 2018 Cliff Pennington roster status changed by Round Rock Express. May 24, 2018 Round Rock Express placed 2B Cliff Pennington on the 7-day disabled list retroactive to May 22, 2018. May 19, 2018 2B Cliff Pennington assigned to Round Rock Express. May 18, 2018 Texas Rangers signed free agent 2B Cliff Pennington to a minor league contract. May 18, 2018 2B Cliff Pennington roster status changed by Round Rock Express. April 28, 2018 Cincinnati Reds sent Cliff Pennington outright to Louisville Bats. April 26, 2018 Cincinnati Reds optioned 3B Cliff Pennington to Louisville Bats. March 29, 2018 Cincinnati Reds selected the contract of Cliff Pennington from Louisville Bats. February 15, 2018 Cincinnati Reds signed free agent 2B Cliff Pennington to a minor league contract and invited him to spring training. February 15, 2018 2B Cliff Pennington assigned to Louisville Bats. November 2, 2017 2B Cliff Pennington elected free agency. August 2, 2016 Los Angeles Angels activated 2B Cliff Pennington from the 60-day disabled list. July 20, 2016 Los Angeles Angels sent 2B Cliff Pennington on a rehab assignment to Salt Lake Bees. July 18, 2016 Los Angeles Angels transferred 2B Cliff Pennington from the 15-day disabled list to the 60-day disabled list. Left hamstring strain. May 28, 2016 Los Angeles Angels activated 2B Cliff Pennington from the 15-day disabled list. May 25, 2016 Los Angeles Angels sent 2B Cliff Pennington on a rehab assignment to Inland Empire 66ers. May 13, 2016 Los Angeles Angels placed 2B Cliff Pennington on the 15-day disabled list. Left hamstring strain. November 17, 2015 Los Angeles Angels signed free agent 2B Cliff Pennington. November 2, 2015 SS Cliff Pennington elected free agency. August 9, 2015 Toronto Blue Jays activated SS Cliff Pennington. August 8, 2015 Arizona Diamondbacks traded SS Cliff Pennington and cash to Toronto Blue Jays for SS Dawel Lugo. August 6, 2014 Arizona Diamondbacks activated SS Cliff Pennington from the 15-day disabled list. August 2, 2014 AZL D-backs sent SS Cliff Pennington on a rehab assignment to Reno Aces. July 26, 2014 Arizona Diamondbacks sent SS Cliff Pennington on a rehab assignment to AZL D-backs. October 20, 2012 Arizona Diamondbacks traded CF Chris Young to Oakland Athletics for SS Cliff Pennington, Yordy Cabrera and Yordy Cabrera. August 7, 2012 Cliff Pennington roster status changed by Oakland Athletics. August 3, 2012 sent SS Cliff Pennington on a rehab assignment to Sacramento River Cats. July 31, 2009 Oakland Athletics recalled SS Cliff Pennington from Sacramento River Cats. June 17, 2005 Oakland Athletics signed SS Cliff Pennington.